If you've been around my little nook of the internet for about a year, you know I have a deep love for sun care, and in particular Hawaiian Tropic®. I’m sharing Hawaiian Tropic in my life as part of a sponsored series for Socialstars™#AlohaTherapy As always, all opinions and thoughts are always honest and always my own. Every single time I decide to go outside, especially in the spring and summer, I ensure I have this lotion on my face and that I've given it ample time to soak into my skin. There's lots of girls' lunches, weddings, happy hours and lots of fun happening that makes it important for me to always wear sun protection, especially on the face. Even if you're getting into your car, you 150% need some sun protection on your face and skin. 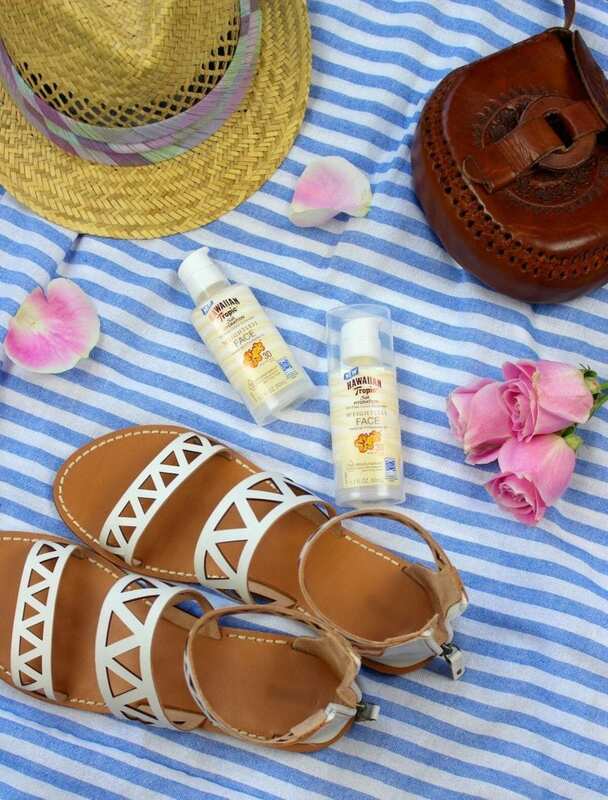 After I apply the Hawaiian Tropic® Silk Hydration™ Face Lotion, I grab my favorite sandals, cute fedora hat, teeny tiny summer bag and head out the door. While I may not be heading anywhere tropical anytime soon, this Hawaiian Tropic® Silk Hydration™ Face Lotion makes me feel like I'm in a tropical place because of the pleasant scent. All of their sun care products make me happy, and are effective. When I first moved to Arizona, I became a huge sun care advocate for myself and everyone around me because the sun is no joke. We're talking 120 degrees Fahrenheit in the summer people. I didn't stutter. 120 degrees Fahrenheit. Recently, I have been looking for the perfect protection for my skin on an everyday basis. Hawaiian Tropic® Silk Hydration™ sunscreens are very protective, providing broad spectrum UVA and UVB protection and they also have that luxurious skin enhancing nourishment of a premium moisturizer. You know I'm a skin care fanatic too, so this is honestly the perfect combination for me. This is what I've been looking for the past few months. I need a good moisturizer and sun care, and Hawaiian Tropic® makes it so easy! Hawaiian Tropic® Silk Hydration™ Face Lotion includes ingredients like plumeria, guava, passion flower, papaya, mango and aloe. Needless to say it smells amazing, and I'm a big fan of facial products that have a pleasant scent. I can't handle certain products due to their scents, and that's why I hesitate to use some brands. The other element I really love about this lotion is the fact that it's lightweight, and doesn't feel like thick and heavy sunscreen being applied. While the lotion does have SPF 30, you must reapply every 2 hours to ensure you get the full protection and benefit of the lotion, especially if you're sweating (that's me! ), swimming and wiping your skin. While I recommend reapplying frequently, the moisturization affect of the lotion lasts for up to 12 hours which is incredible. Normally when you apply any sun protection lotion, the moisture is not really there. Happy to report this will keep you hydrated throughout the day! You can find this lotion at Ulta, Target and any grocery or mass retailer. What's your favorite sun care face lotion?